Conor McGregor is facing his first major lawsuit from his bus assault in April after lightweight contender Michael Chiesa filed with the state of New York on Monday. 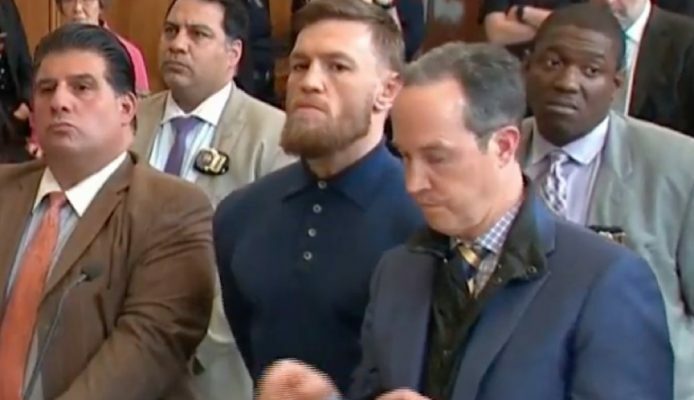 Conor McGregor may have settled his criminal case in New York after assaulting a bus filled with UFC fighters back in April but it appears his time in civil court is just beginning. Sources close to Chiesa confirmed his lawsuit was filed in New York on Monday following an initial report from TMZ. The entire situation unfolded just days away from UFC 223 back in April when McGregor showed up at the Barclays Center unannounced while going after Khabib Nurmagomedov for a separate incident earlier the same week with his teammate Artem Lobov. McGregor stormed through the arena with several of his friends before going after Nurmagomedov, who was on a bus that was transporting fighters back to their hotel after doing media that day. McGregor never got to Nurmagomedov but he did launch a moving dolly at the bus that smashed a window with glass then injuring several people. Chiesa was amongst those who suffered injuries and he was forced out of his fight at UFC 223 against Anthony Pettis. Now Chiesa is seeking damages including lost wages as a result of that bus assault, although he doesn’t name a specific amount of money he’s seeking from McGregor or the Barclays Center. McGregor pled guilty to disorderly conduct in July to close out his criminal case in New York but now he’s got a civil lawsuit to deal with presumably after his upcoming fight against Nurmagomedov at UFC 229 in Las Vegas.